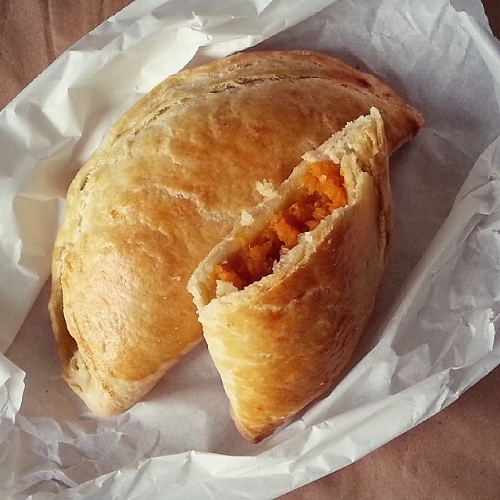 Pumpkin Pasties. Harry Potter and the Philosopher's Stone. He had never had any money for sweets with the Dursleys, and now that hehad pockets rattling with gold and silver he was ready to buy as many Mars Bars as he could carry — but the woman didn’t have Mars Bars. What she did have were Bettie Bott’s Every Flavor Beans, Drooble’s Best Blowing Gum, Chocolate Frogs. Pumpkin Pasties, Cauldron Cakes, Licorice Wands, and a number of other strange things Harry had never seen in his life. Not wanting to miss anything, he got some of everything and paid the woman eleven silver Sickles and seven bronze Knuts. Ron stared as Harry brought it all back in to the compartment and tipped it onto an empty seat. “Starving,” said Harry, taking a large bite out of a pumpkin pasty. “Go on, have a pasty,” said Harry, who had never had anything to share before or, indeed, anyone to share it with. It was a nice feeling, sitting there with Ron, eating their way through all Harry’s pasties, cakes, and sweets (the sandwiches lay forgotten). This week we return, once again, to the dream English food of my childhood. It's little wonder England was so appealing; the sweets and treats so magical that even the humblest of foods - the pasty - seemed otherworldly. Though I can't make chocolate frogs jump, create sugar mice that actually squeak or snack boxes to get you out of class (not, at least, without contravening several health laws), I can make a pasty. A quick Google search reveals that I'm certainly not the first to try to recreate this snack, but most of the offerings are sweet, laced with condensed milk or sugar. I actually imagine it to be very simply spiced mashed pumpkin, enveloped in puff pastry - much more akin to the Cornish pasties I'm familiar with. The scene above is lovely - it's one for anyone who has forged a friendship over a school lunch. It transcends the wand and spells that follows it. There's a magic about the extravagance and thrill of having not only countless new sweets to try, but a pocketful of strange coins with which to buy them, that sits squarely in our world of everyday magic. It's always stayed in my head - and although I struggle a bit with Harry's character in books 3-6, this generous boy on the train, who has never before had a friend to share lunch with, immediately got me on side. 1. Put the flour and salt in the bowl, then add the chopped butter and toss it in the flour. Slowly add the iced water, mixing with your hand, stopping as soon as you have enough to turn the mixture into a firm dough. 2. Lightly flour your bench and rolling pin, and roll the pastry into a long rectangle about 0.5cm thick. Fold the top third of the pastry down, and the bottom third up and over this, so you have three even layers. Turn the pastry 90 degrees and repeat the roll and fold. Repeat three more times (until you have rolled and folded the pastry five times in total). Place the pastry in the fridge for at least 30 minutes, or up to 24 hours. 3. Fill the saucepan with water and put it on to boil. Peel and then chop the squash into evenly sized cubes - about 2cm wide. Tip them into the now boiling water and cook for around 10 minutes, until a skewer easily pierces a piece. Drain. 4. Preheat your oven to 190C. Mash the squash in the saucepan. Once cool, add the spices and stir them through. 5. Remove the pastry from the fridge and, on a lightly floured bench, roll out until it is around 0.5cm thick. Using a side plate as a template, cut out rounds of pastry, rolling the offcuts back together to make five discs (depending on the size of your side plate, the pastry may only make four). Place a couple of spoonfuls of squash on half of each pastry disc, leaving a 1.5cm border. Wet the border of the disc, and press the edges together to create a semicircle. Crimp the border to ensure the edges stay together during the bake. Repeat with the rest of the dough. 6. Transfer the pasties to the baking tray and paint them with lightly beaten egg. Bake them for around 35 minutes, until golden brown. I ate mine with a herb salad but, like Harry and Ron, you could eat them straight out of a paper bag if you fancy.